Back in November Becky and I attended our first craft fair. It was in support of the United Way so table rental fees and a donated raffle item went to charity. Becky and I have been making earrings for about 2 years now. This started when I decided to make 3 pairs as part of Becky’s Christmas gift two years ago. One of the pairs was made from a large crystal which a family friend bequeathed to us when he lost his battle with cancer. 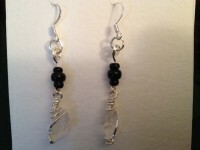 I was able to remove two pieces small enough to create a pair of earrings for her to remember him. 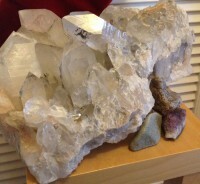 Here is the full crystal…. Since that time we have made and sold many pairs of earrings. During the craft fair one lovely woman who bought a pair of earrings was actually sending them to a relative in Germany. How cool! In addition to earrings, we have also been making handcrafted soap and an amazing natural lip balm which we have been using, and decided to sell them as well. Being our first craft sale we didn’t know how people would respond to our handmade items. 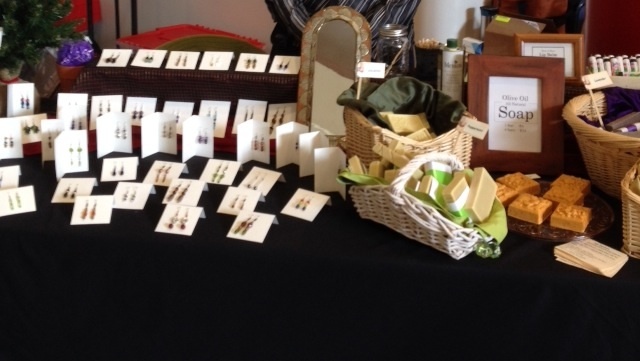 As it turned out the soap and lip balm disappeared very quickly with additional orders coming in after the fair. The earrings did well too, but we wish we had made more soap! It’s interesting how things unfold. A Christmas gift of handcrafted earrings turns into selling them. The soap making also started as a gift. Last Christmas I bought Becky all the needed items to start making soap. I planned the sequence of the individual items she opened to maximize her confusion. Seemingly random items which had nothing to do with one another were slowly unwrapped. One item, which didn’t quite fit under our “stocking stuffers only” gift exchange rules, was a wooden soap mold which I made for her. It was added to the pile of strange items laid out before her until finally she unwrapped the instructions and it all made sense. We always have lots of laughs on Christmas morning, which is the way Christmas should always begin, filled with laughter, smiles, kisses and hugs. This most recent Christmas we decided not to exchange gifts at all, and we still had a great morning filled with those same things. That’s the long version of how we ended up making those particular items. That’s the way life is sometimes. It turns and twists, and before you know it you are at a craft fair selling things that you enjoy making and using yourself. We sure make one hell of a team! Posted on January 7, 2015, in Christmas, Homesteading, Homesteading In The City and tagged cancer, castile, Christmas, craft fair, Crafts, earrings, handcrafted, handmade, homemade, Homesteading, jewelry, lip balm, olive oil, soap, Toronto Public Library, United Way, urban homesteading. Bookmark the permalink. 3 Comments. Yes you do (make one hell of a team)! And now you have an entire year to prepare for the next Christmas Fair, but then who knows where the turns and twists will take you! Thanks! What kind of crafts do you do? It would be great to see some of your projects too.